In our quest to see a lot of what makes southwestern Germany tick, we’re off on a lot of short trips to some very small towns in this corner of the country. We’re fortunate to have wonderful hosts here, who are eager to show us the area, and to see things they also might have never seen themselves. In this case, though, our host, dust, knows all about Breisach, and was more than happy to give us the lay of the land as we visited this historic town of 16,000 earlier this week. Breisach is situated in the Rhine Valley, just west of the Black Forest and across the Rhine River from France. Known for its sweeping views of the surrounding hills and distant mountains (and unfortunately, views of all of the industrial plants that pepper the shores of the river), the documented history of the city dates all the way back to the 11th century. 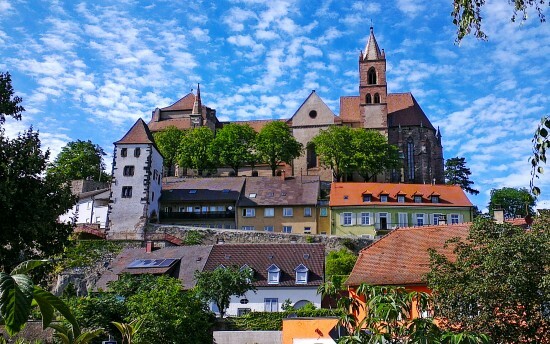 The famous St. Stephansmünster (St. Stephan’s Cathedral) sits upon the city’s highest point, and is guarded by several levels of walls that face outward toward the river and the rest of the town below. lt is quite impressive as it comes into view when one gets closer to the town on the small country roads we took to get there from Staufen. As we parked the car and began our local journey, it was quite imposing over the land, and took quite a hike to get up to the top. 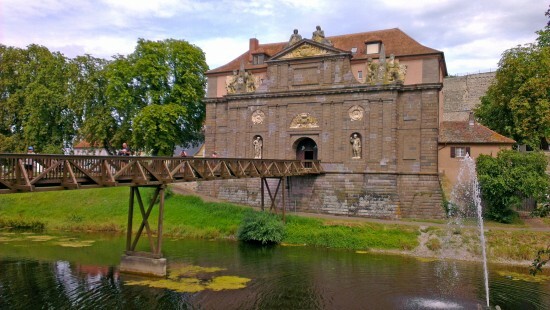 There remains only one original entrance across the moat and into the city walls, and this building houses the town’s history museum and many artifacts. Fortunately, the steep walk up also provides you with a very nice walk through the historic city center, with its colorful and traditional houses, small streets, and informative signs that mark the history of the village. Along the streets, pieces from famed sculptor Helmut Lutz seem to pop up everywhere, showing a rich, if small, artistic side to the city that I did not expect. Once we reached the cathedral, we were treated with panoramas in every direction, and given what felt like an impromptu history lesson and tour by dust, who talked about how much of the town was destroyed during World War II (85%! ), and what was rebuilt properly and improperly, to his high historical standards. Lutz also produced the sculpture that adorns the inside of the church’s old crypt, which was refashioned as a memorial to the town’s destruction and loss during the war. 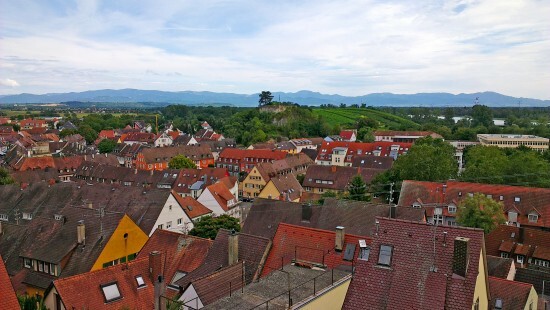 After a walk down the hill’s winding streets, we ended up in the commercial part of town, where he and his partner, Laura, took us to their favorite ice cream spot – which very well could be the real reason they wanted to drive to Breisach in the first place. 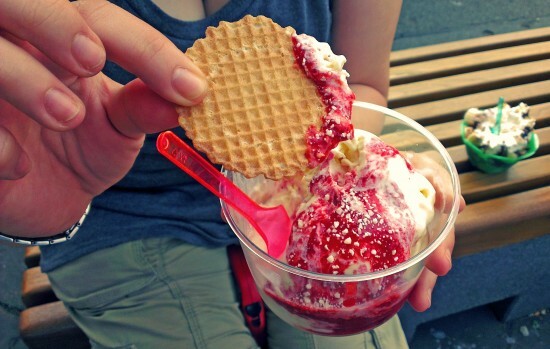 Ice cream parlors are a big thing across Germany, and this small town has no shortage of them. However, the preference seems to be Café Veneto, which is owned and run by Italians who spend summers in Breisach and winters back in Italy. It was the only ice cream parlor that was crowded, and I felt more like we were in a tiny version of a hectic stock exchange floor than a small-town ice cream shop. The payoff, though, was glorious, as we were blessed with their famed “Spaghetti Eis,” which is ice cream run through a pasta press, before being turned into a strawberry sundae with whipped cream and white chocolate sprinkles. I went for the banana hot fudge sundae, and was not left disappointed. After that indulgence, we wrapped up our day trip and headed back to Staufen. While I wouldn’t recommend Breisach as a base when you visit the region – simply because it’s quite touristy and I couldn’t imagine spending every morning and evening there – I think it’s worth a full day, and is a good side trip if you visit the Rhine Valley or Black Forest. 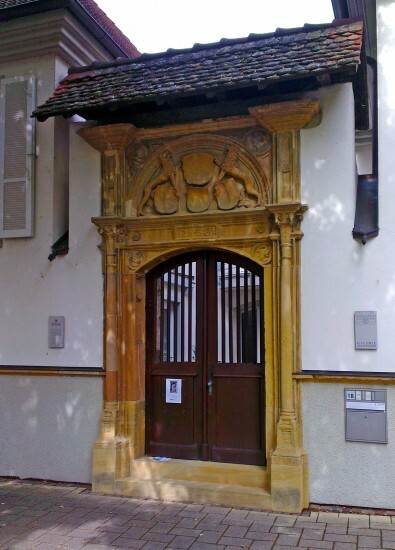 You can find more information about Breisach on the town’s official website. You can also see more pictures from our trip to Breisach on our Facebook page. 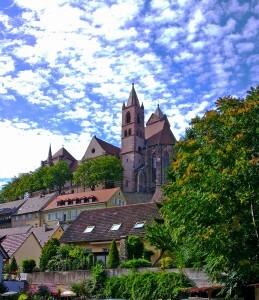 Have you ever visited Breisach? If so, what did you think? Let us know your thoughts in the comments below! I feel like I was there with you! Thanks for the tour! Well done! Please don’t think me trite to read that whole post — which was well written and supplemented with cool, enticing photos — only to comment: SPAGHETTI-EIS, Ja! Süßes Deutschland!